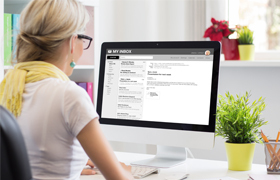 If you check your email more often than regular mail, paperless billing is for you! You can have your monthly electric bill notification e-mailed to you. It’s simple and convenient. When you choose paperless billing, you will receive an email each month when your statement is available to view online at the JOEMC website. Multiple layers of online security protect your personal information and you can keep private financial information out of your postal mailbox. If you already have an online billing account set up, log-in and select the “Account Management” option from the column on the left side of the page. You’ll then choose the “Paperless Options” tab and be able to choose from email notification and paperless bill. Check out Notifications (also on the left side of the page) to set up a reminder for due dates. If you don’t have an online billing account established, signup is easy. Go to the Payment Options section under the Member Account tab and quickly register. Please note that you’ll need your electric account number to complete the registration. If you have any further questions, explore our Frequently Asked Question Section, call the office at (910) 353-1940 or (800) 682-1515 or email us.